Sally Beaver Buckner, 86, died at Glenaire Retirement Community in Cary, on Sunday, January 7, 2018. Sally was born in Statesville, NC on November 3, 1931. She was raised in Albemarle and, after graduating from high school, attended Women's College (now UNC-Greensboro). In college, she served as editor of the student paper and landed an interview with Eleanor Roosevelt. After graduating with a BA in English in 1953, she married Robert Buckner and they started a family in Fayetteville. 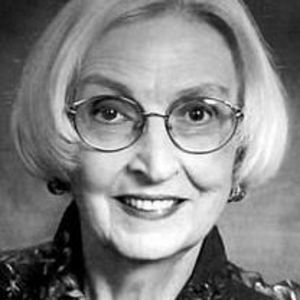 She and her family moved to Raleigh in 1965, where she worked for the Raleigh Times and taught at NC State University before joining the English faculty at Peace College. Sally continued her education, gaining an MA in English at NC State University in 1970 and a PhD at UNC-Chapel Hill in 1980. In addition to teaching, she served as co-director of the Capital Area Writing Project, chair of the NC Writers' Conference, served on the board of directors of the NC Autism Society, President of the NC English Teachers' Association, and a member of the NC Literature and History Society, NC Writers Network, NC Poetry Society, and the NC Literature Hall of Fame selection committee. Sally published two anthologies of North Carolina literature, Our Words, Our Ways: Reading and Writing in North Carolina (1991), and Word and Witness: 100 Years of North Carolina Poetry (1999). She also authored collections of her own poetry, including Strawberry Harvest (1986), Collateral Damage (2008), and Nineteen Visions of Christmas (2011). She received first place awards for her poetry in the Windhover and Crucible publications. Other recognition includes the Ragan-Rubin Award, the R. Hunt Parker Award, the Sam Ragan Award, the City of Raleigh Arts Commission Medal of Arts Award, the Wake County YWCA Academy of Women Arts Award, and the NC Teachers Association. In 2016, Sally was awarded the distinguished Order of the Long Leaf Pine from the State of North Carolina. In 2017, she was recognized at William Peace University for her years of service with an honorary doctorate. Sally enjoyed travel, camping, music, and going to productions by local theatres and the symphony. She was a passionate advocate for social justice and served on the Peace and Justice Committee at Pullen Memorial Baptist Church. After September 11, 2001, she and her husband opened their home to the local Triangle Tikkun chapter to encourage dialogue and deeper understanding between faiths. She is survived by her brother and his wife, Gerald and Carolyn Beaver, of Fayetteville, her daughter, Sally Lynn Buckner, her son and daughter-in-law, Ted and Serena Buckner, grandsons Dane and Graham Buckner, granddaughter-in-law Kelly Buckner, and great grandchildren Cora Buckner and Tanner Dunn, all from Raleigh. Sally was preceded in death by her son, George Buckner, and her husband, Robert Buckner. A service celebrating the life of Sally will be held at Pullen Memorial Baptist Church, at 1801 Hillsborough Street in Raleigh, on Friday, January 19, at 1:00 pm, followed by a reception at the church. In lieu of flowers, memorial gifts can be made to Pullen Memorial Baptist Church or The Autism Society of NC at 5121 Kingdom Way, Suite 100, Raleigh, NC 27607. Arrangements by Brown-Wynne Funeral Home, Saint Mary's Street, Raleigh.